My Glossybox, along with a couple other January sub boxes, was delayed this month due to the crazy weather phenomena that've been forcing half the country to shelter in their apartments like hibernating bears for the past few weeks. Still, the folks at Glossybox were kind enough to alert me to the delays, and managed to deliver before the month ended (on January 31, to be exact! ), so the wait wasn't too painful. Was this the most anticipated Glossybox ever? I don't know, but there was so much discussion about the Beautyblender sponge leading up to its delivery that it sure seemed that way. Beautyblender or no, for the packaging alone, it's always a treat to receive this shiny, elegant pink box in the mail. This month's theme, as you can see on the cover of the insert, is "Welcome to 2014!" I imagine the contents of the box are meant to get you primed for a healthy beauty regimen in the new year, although they didn't particularly scream resolutions or new beginnings to me. Check out the little foam-rolled surprise on the right! 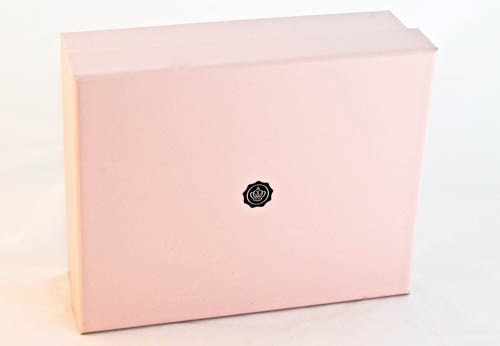 Way to elevate the glam factor of a humble foam sheet with a classy Glossybox logo sticker, and to keep the element of surprise going 'til the last moment! Extra bonus points for packaging this month. Beautyblender sponge and solid cleanser. $19.95 for a full-sized sponge and $15.95 for a 1 oz solid cleanser. And here's the famous Beautyblender! Confession: I'd never even heard of the Beautyblender until I started reading spoilers about this January box. I rarely wear foundation, and always apply my BB cream and concealer with my fingers, which I think are the best makeup application tools available, yielding the most natural result, and costing exactly nothing. 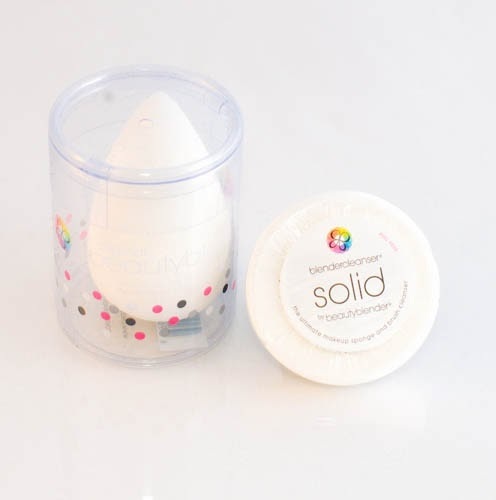 But I admit that this tiny, fragile, egg-shaped sponge is sort of lovely, and I'm impressed with its versatility: it's purported to work with wet or dry foundation, to allow for flawless blending using a stippling motion, and to provide great coverage with its bendy, tapered design. I may have to give it a whirl. I admit that I was expecting to receive the cute mini bottle of cleanser I'd seen in other unboxings, so I couldn't help being disappointed at the sight of this homely cleanser pastille. I wonder why some boxes got the liquid cleanser and some the solid. Maybe it was just the luck of the draw. Oh well. Bellápierre Cosmetics Mineral Blush in Desert Rose. Glossybox lipstick in Glossy Pink. $14 for a full-sized 0.14 oz. 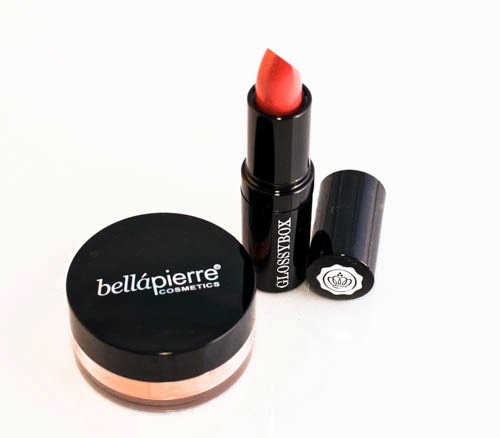 Another couple of firsts: Bellápierre Cosmetics is totally new to me, as is mineral makeup in general. This peachy-pink shade is eminently wearable, though, with just a hint of shimmery bronze that'll be great for spring. I haven't tested it yet, but I know mineral makeup is famously gentle on sensitive skin, so I'm game to try it (although I'm irrationally loyal --this is a recurring theme for me-- to my Benefit Dallas bronzer/blush). The Glossybox lipstick was a bonus item I received for resubscribing and using a coupon code which, sadly, is now inactive. But you can plug in code HEARTS, which should be active through today, February 16, or BELLA, which works through February 28 and gets you a Bellápierre lipstick. The color is actually more of a rose-pink, much less red than it appears in the photo above. It's pretty creamy and goes on super sheer, almost like a gloss, which I love. A keeper. 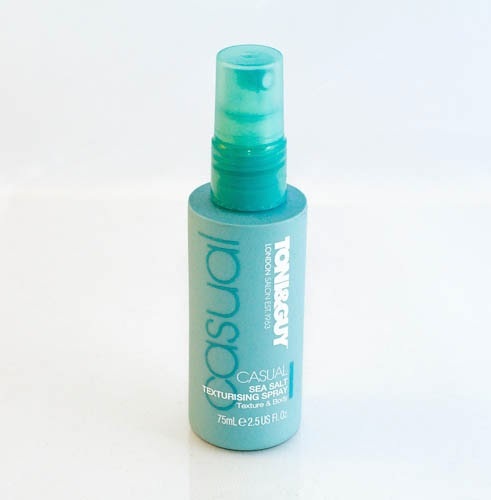 Toni&Guy Casual Sea Salt Texturising Spray. 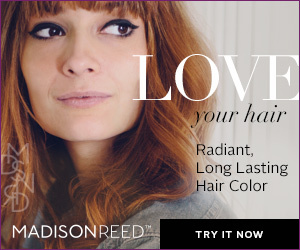 $14.99 for a full-size 6.8 fl oz; sample is 2.5 fl. oz, about $5.51. I have long, thick, super-straight hair, so I usually shy away from texturizers in fear they'll leave me with a goopy, matted mane. Yeah, I'm not much of a hair artiste. I'm wondering if spraying this on strands before curling with a hot iron might help set the waves, though -- my hair seriously won't hold a curl, so I'm always on the lookout for that miracle product that'll get me to finally, finally keep a hairstyle from falling flat five seconds after styling. Anyone used this spray for reasons other than those intended by Messrs. Toni&Guy? BCBGMaxAzria Bon Genre Eau de Parfum. $75 for a full-size 3.4 oz; sample doesn't list its volume, but it's about the size of a roll-on, so I'm going to guesstimate its price at about $25. 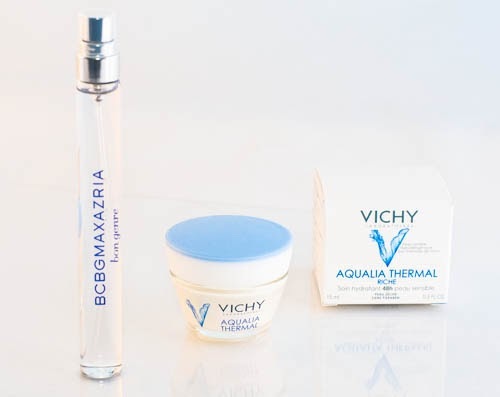 Vichy Aqualia Thermal Rich Cream. The Bon Genre perfume is a slightly spicy floral with --to my nose-- patchouli and vanilla undertones. It's a nice evening scent, but nothing too complex or terribly interesting. I wouldn't run out to buy it, but I'll probably use it here and there. As for the cream, I've used Vichy products before and they are consistently excellent; also, I seriously can never get enough of facial moisturizers, creams, and serums, so this'll be a welcome addition to my menagerie. All in all, I'm pretty happy with my Glossybox, although it wasn't the bells-and-whistles, confetti-and-champagne, Great Gatsby sort of new year's box I was hoping for (La Prairie spoiled me, you guys). Still, I got some new-to-me products to try, and a couple of dependable performers that'll save me a trip to the drugstore. 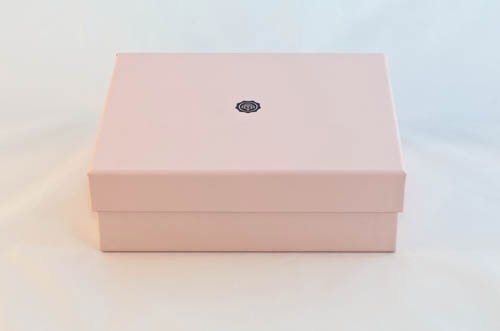 Add in the total retail value of this box, which is approximately $107, and the happiness quotient increases significantly -- at $21 for a variety of luxe products, this subscription is a steal. What did you think about the January Glossybox? Did you get different items in yours?